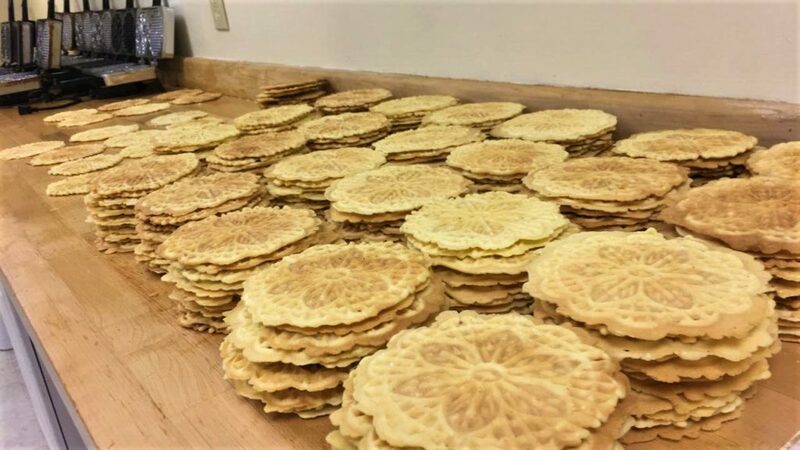 For the past two years, Weaver’s Orchard has been offering authentic Italian cookies of the thin waffle-looking variety through Bellapizzelle run by Denise DiNorscia Williams. 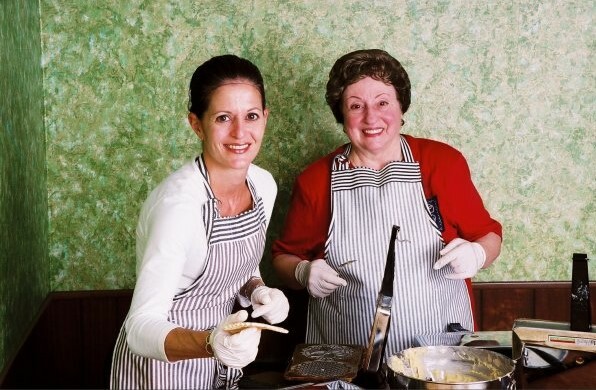 Having opened and founded the business in 2002 in the kitchen of her mother Lucy’s home in Kennett Square, with the two working side by side in the food-centric tradition of their family’s homeland, Denise eventually began making the pizzelles in her own home in Morgantown and has an FDA-approved bakery space for this specialty. Her career in marketing and giving away her freshly baked pizzelles as gifts to clients—and such enthusiasm for the sweets—is what led her to open the business, along with Lucy wanting to invest her retirement in doing something she loved. Denise reflects on how her history of marketing jobs spanning more than 30 years fed into benefiting Bellapizzelle: “You can say I am maintaining a long-term strategy of bringing value to people who appreciate nostalgia, authenticity, no preservatives and chemicals—and who love a hand-crafted artisanal cookie,” she says. She explains that in Italy, these iconic cookies are known as Ferratelle. Denise’s grandparents moved to the U.S. in the early part of the last century, relocating from Penne in the Abruzzo region. Her family has always had freshly baked pizzelles around—not just at holidays— so the tradition of making and eating them has been with them for many decades. The recipe has withstood time while new taste buds have also come to appreciate it. Dwayne Musser, the market manager for Weaver’s Orchard, gets a chance to see customers’ enthusiasm for Denise’s pizzelles. Dwayne also points out that they pair wonderfully with some ice cream. 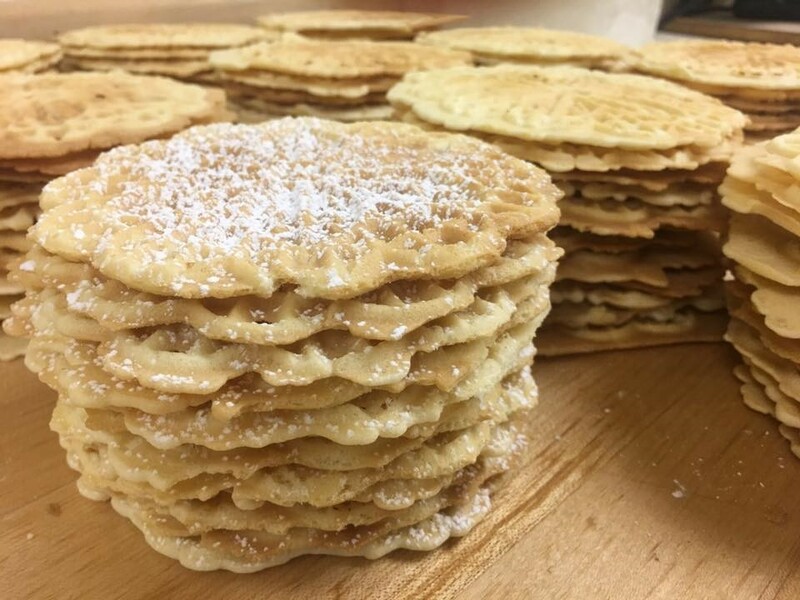 Denise elaborates that mass produced pizzelles often carry a less than ideal flavor with many more ingredients (and difficult to pronounce ones) than seem necessary for a cookie. Her hand-made reminders of Italy were first shaped by four pizzelle irons, with one of them as a historic kitchen piece from the Vitantonio brand, passed down through her family. Today, she has a rotation of “about 20 regular size pizzelle and 15 mini size pizzelle irons,” Denise confirms. In time, culinary curiosity for Denise’s ever-thin sweets led to demonstrations at food shows and features on news programs, radio shows, blogs and publications like Woman’s Day Magazine. A customer enjoying the most recent Taste of Weaver’s sampling event visited Denise to try her pizzelles, having baked them in his own childhood, and commented on the authenticity of Denise’s cookies. This clip shows his feedback and enthusiasm. “People always say, ‘I don’t like the anise or licorice flavor,’” she adds. She then suggests that they try her pizzelles since they’re not what people expect in an initial bite. “We don’t use the typical anise extract but rather a sweet oil from New York—very different from the traditional anise flavor,” she says. Lucy, now 94, moved into a retirement home late last year, and this is Denise’s first summer baking without her mother, a bittersweet change.